Eunice, the last of my mother’s cousins, died a few days ago aged 87. 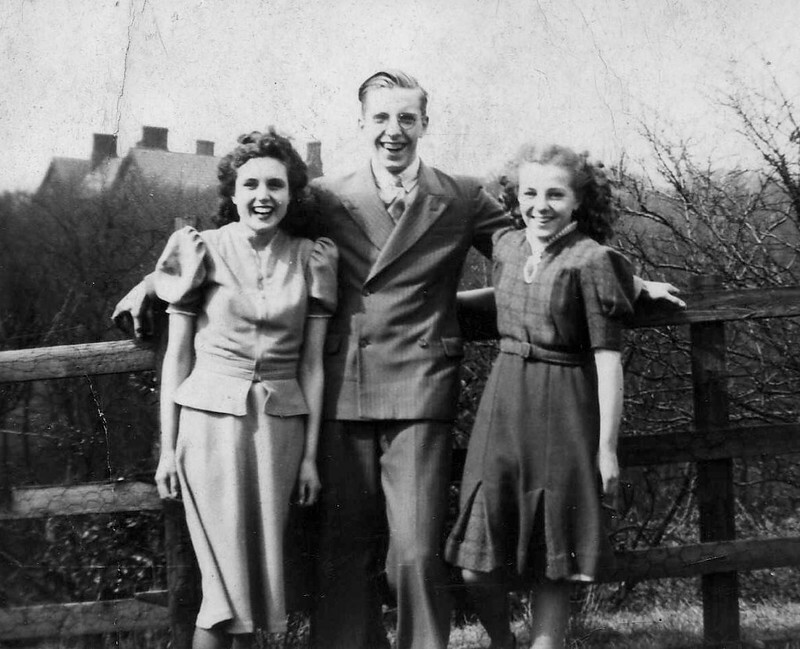 I have vivid memories of holidays and Christmases spent with them in Colwyn Bay, North Wales, where her husband Don ran an optical practice and she ran a couple of antique shops. Their lifestyle was very different from my quiet, impoverished life as an only child with my widowed mum. Not only did it include holidays abroad, boarding schools and sports cars for their two sons as soon as they were old enough to drive. Eunice was a volatile character, the complete opposite of her unassuming but equally determined husband. She loved luxury, drama and excess. Chronically restless, she was always moving house, or having the one they lived in torn apart and renovated, only to lose interest and sell it halfway through. You could never be certain that the furniture that was in the house on Monday morning, or the beautiful Wedgewood china you had eaten Sunday lunch off, would still be in the house on Monday night. She was a magpie, shamelessly acquisitive, particularly drawn to all things shiny and valuable. I remember that once they bought a house across the road and didn’t get around to moving into it for a couple of years. In the end her elder son, losing patience, moved the table and chairs over the road while she was cooking Christmas dinner and we ended up serving it over there. I was utterly captivated. She was impossible to live with, selfish, capricious, spoilt and irresistible. Nobody adored her more than Donald, and I often wondered what the family of this unassuming Quaker man made of his utterly unexpected choice of soul-mate. He fell in love with her at first sight when she was 17, married her at 22 and cared for her with absolute devotion for the last two decades of her life, as a series of strokes gradually robbed her, slowly and painfully, of her faculties. Terrible muscle spasms made it impossible to feed or move her without help for days on end, but the only time she went into residential care was for six weeks while he recovered from a heart attack in his eighties. He pestered mercilessly until she was allowed back home. She was an exhausting patient, apt to come out with the most offensive and embarrassing remarks at odd moments and to berate him for his meanness and foolishness as he struggled to push her wheelchair up the steep path of the house, high on a hill with a beautiful panoramic view of the North Wales coastline she’d fallen in love with in the 1940s and refused to leave. He would not consider moving somewhere more convenient. Her world had shrunk to two rooms by then; he would not deprive her of that balcony and its glorious view. I can’t begin to imagine how he used to get her up that path, or into the car for their daily outings along the sea front at Rhos-on-Sea or to nearby teashops. Or how he put up with the way she treated him, or behaved in public. Somehow, he did all that and also kept up a barrage of letters to the press throughout the last Iraq war, part of his lifelong campaigning for peace. His meek demeanour hid a core of absolute steel, and the twin rocks that formed the foundation of his life were his utter devotion to Eunice and his commitment to the Quaker faith. I felt down for days. I think I deserved it, to be honest. As it happened, the day before she died was my own 53rd birthday, and my son gave me a remarkable book as a gift. 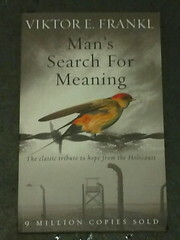 It’s called Man’s Search for Meaning, and my heart sank a little to see that it was yet another heavy-going Holocaust memoir. My son is a philosopher, through and through – he tends to avoid light reading. But yesterday I picked it up and read it at one sitting. Again, I’ve been humbled. It is one of the most moving and uplifting testaments I’ve ever read to the resilience of the human spirit. The author, Viktor Frankl, was the founder of the third great 20th century Viennese school of psychology. When he was deported to Auschwitz with his wife of less than two years, he hid in his clothes a manuscript that he regarded as his life’s work. It was the foundation of what he called Logotherapy – the theory that human mental distress is relieved primarily with the discovery of meaning in life. This theory was hammered out in the agony of four notorious concentration camps and the loss of almost his entire family in the Holocaust. The manuscript he treasured was ripped from him by the Nazis and destroyed before his eyes on the day he arrived at Auschwitz. He was forced to strip naked and given the filthy rags of a less fortunate prisoner who had already gone straight to the gas chambers. In the pocket of the coat his hand closed around a scrap of paper – it turned out to be a page torn from a Hebrew prayer book, containing the Shema Yisrael. “How should I have interpreted such a ‘coincidence’ other than as a challenge to live my thoughts instead of merely putting them on paper?” he reflected. After the war, he not only rewrote the manuscript he had lost, but it was immeasurably deepened and strengthened by his personal suffering. He firmly believed that meaning in a human life might be found in three distinctive ways. First, by the creation of something of lasting value. Secondly, by complete and loving devotion to at least one other human being, and thirdly by the graceful and humble experience of suffering as the means of personal growth. I do not think that we have earned any right to argue with him. Ultimately, man should not ask what the meaning of his life is, but rather he must recongise that it is he who is asked. In a word, each man is questioned by life; and he can only answer to life by answering for his own life; to life he can only respond by being responsible. Love is the only way to grasp another human being in the innermost core of his personality. No-one can become fully aware of the very essence of another human being unless he loves him. By his love he is enabled to see the essential traits and features in the beloved person; and even more, he sees that which is potential in him, which is not yet actualized but yet ought to be actualized. Furthermore, by his love, the loving person enables the beloved person to actualize these potentialities. By making him aware of what he can be and of what he should become, he makes these potentialities come true. Who am I to say whether Eunice was a worthy object of the lifetime of love that this man lavished on her? The truth is that Don saw a potentiality in Eunice, from the night of their first meeting in 1942, the same year as Frankls’s arrival in Auschwitz, and the actualization of that potentiality became his lifetime’s work. If he had achieved nothing else – and that if far from being the case – his life would, by Frankl’s definition, be completely meaningful. And who am I to conclude that Eunice would have been incapable of recognising me or responding to my presence? Nothing mattered more to her than her family history. It really does not matter whether she recognised me or mistook me for my mother, who died in 1983. At the very least, I failed Don, because I had the opportunity to bring him joy by offering myself to his beloved. It seems to me that there is nothing which would stimulate a man’s sense of responsibleness more than this maxim, which invites him to imagine first that the present is past and, second, that the past may be changed and amended. Such a precept confronts him with life’s finiteness as well as the finality of what he makes out of both his life and himself. I have many goals in life. To finish painting the garden fence – two coats, all round, concrete included. To complete my latest enormous, self-inflicted cross-stitch project within two years. To read Dante’s Inferno and Wordsworth’s Prelude. It’s good to have goals. I’ve become better at achieving them and making myself accountable for them. But they need to be the right goals. The ones that give meaning to my life, and recongise the meaning of the lives of others. I am so grateful to Frankl, and to my son, for what I have learned this week. And I hope it continues to change me – for the better.